There have been plenty of cool cloth and papercraft Skyrim props over the past several months. Kotaku reader and crafter Shannon Clawson looked at those and said, "P'shaw! Amateur hour!" Well, he probably didn't say that. 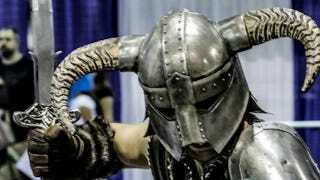 But he did get inspired to make this Nord helmet out of real steel, and he sent us some great pictures. This video shows the process behind the helmet. I have a feeling that Clawson's workshop has better tools than even Eorlund Gray-Mane's Skyforge. I wonder if every time you ask to buy something from Clawson, he says "Gods be praised!"